​The following appeared in a news article in St. Louis (unknown date). An illustration of J.S. Hutton appears alongside the article: "Through the coutesy of Mr. Merritt Hutton Marshall, an old resident of St. Louis city and couty, and a lineal descendant of the venerable man whose picture is presented herewith we are enabled to bring a veritable forefather's life and "likeness" before our readers. The picture is made from a paintng by Charles Wilson Peale, the celebrated American painter and naturalist. the original picture was painted in the year 1792, when John Strangeways Hutton, its, and our subject, had reached the remarkably old age of one hundred and nine years. 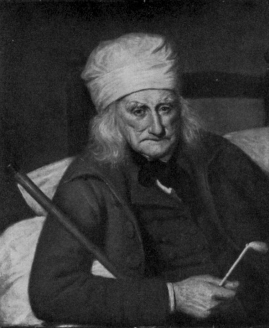 The Peal portrait is still in existence, in Philadelphia, showing the aged man as he appeared in his last year of life. The following particulars of Mr. Hutton's long and eventful life were related to the artist Peale, and by the latter carefully set down. According to these notes, Mr. Hutton was a silversmith of Philadelphia. He was born in New York in 1684, and died in Philadelphia, December 20, 1792. He was, in his early youth apprenticed to a sea captain, and carefully instructed in the art of naviation. An intimacy with a boyish comrade who worked at the "white smith" trade, resulted in a practical knowledge and ability to work at the silversmith trade or business, and although he followed a seafaring life for thirty years, he finally gave it up and gave many years of his long life to the cunning handiwork of the artificer in silver, in which he became specially noted as one of the best hollow-work makers os his then town. Many pieces of his work are said to be in existence. It is said the he made a silver tumbler, when in his 94th year. During his long life he passed through many hazardous adventures, and visited all parts of the globe. He was always temperate to abtentiousness in his appetites. It is related of him that only in one instance did he indulge in the use of liquor, on which occasion he was given a lesson that he never forgot. While he was serving as lieutenant of a privateer in Queen Anne's war, his ship made a descent on ____lage on the Spanish Main; after sacking the ill-fated place, the soldiers and sailors gave themselves up to a season of mirth and revelry in the midst of which, whilst returning to their boats, they were attacked by the irate villagers and of the entire company all were killed save himself and one other. These two were made prisoners and held in long confinement, from which, we regret to say, the notes fail to say how they managed to escape. Mr. Hutton also made a record as an Indian fighter. He was used to tell with pride and we doubt not, with elaborate minuteness in detail, of sundry scouting expeditions against the Indians. In one of these they captured a squaw, who guided them to the Indian camp in such good faship that they were enabled to surprise and kill them all before the redskins could get to their arms. The old gentlemen also knew the noted pirate, Teach, called Blacckbeard, and was at Barbadoes when that bloody buccaneer and his infamous associates surrendered themselves under the Act of Oblivion. This occurred but a little while before the pirate made his last cruise and died in Carolina. Mr. Hutton's father came to America from Bermuda in Scotland, at which place many of his descendants are said to reside now. His maternal grandfather was Arthur Strangeways who died at Boston, aged 101 years. The subject of this sketch was twice married, his first wife having been Catherine Cheesman of New York. Eight children resulted from this union, and of great grandchildren there were twenty five and of great great grandchildren the returns ___ up twenty three. His wife ding, a second marriage bond was signed and sealed by Mr. Hutton when in his fifty-first year, his second wife being a Philadelphia lady named Ann Van Lear, a blooming maiden 19 years of age. The fruit of this union numbered seventeen children, forty-one grandchildren, and fifteen great grandchildren. The grand total of this man's descendants was one hundred and thirty two, of whom forty five were dead at the time of his own death in ___. Mr. Hutton considered himself in the prime of life when sixty years of age. He was a lover of all kinds of outdoor sports, quick temperate and hard-working, and even in the last year of his life, ocould see, hear and wals about with ease. He was a patriach in truth and of this centenarian might well be said, the view of his numerous descendants that through his children's lives he feels his ______ grows immortal in his childrens children's children." Joseph Defrees [DeForest], son of Johannes Deforest and Catherine van Ravenstein, was born in 1711 in New York, New York. He married Mary Catherine Hutton, daughter of John Strangeways Hutton and Catherine Cheesman. She was born in 1715 in New York, New York. 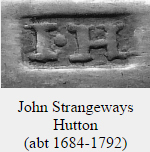 John Strangeways Hutton was a very interesting person. The following article was published by the University of Phoenix Inline from The Windham Herald (aka The Phoenix), issue of Saturday, 22 September 1792: John Strangeways Hutton was born about 1684 in Scotland. He married first, before 1715, at New York City, Kings County, New York, Catherine Cheeseman. She was born about 1688, possibly in New York, and died before 1735 in Philadelphia, Montgomery County, Pennsylvania. John married second, in 1735, at Philadelphia, Ann Van Lear. She was born in Philadelphia in 1716 and died on 14 November 1788 in Philadelphia. John died 23 December 1792, at Philadelphia, and was buried there. From the (Philad.) Daily Advertiser. Mr. Claypoole, believing that the following particular of Mr. John Strangeways Hutton, now living in this city, in the 109th year of his age, may interest the public, they are communicated, with his consent, by your humble servant, C[harles[ W.[ilson] Peale. Philadelphia, Sept. 3, 1792. After having a few days since taken Mr. Hutton's portrait from life, which is to be preserved in my Museum, the following particulars respecting the old gentleman were collected from his children and others of his acquaintance. That he was born in the city of New York, in 1684; was bound an apprentice to a sea-faring man, who out him to school in New York to learn navigation; at which time he became intimate with a boy who worked at the white-smiths trade, with whom he amused himself in acquiring the use of the hammer; from whence he obtained a facility in working at plate work in the silver-smith's business. He followed a sea faring life for 30 years. and then commenced the silver-smith's trade, without having served by apprenticeship to it; yet, in Philadelphia, he has been esteemed as one of the best workmen at hollow work, in that line of business; and there are still pieces of his work in this city much esteemed. He made a tumbler in silver when he was 94 years old. Through the course of a long and hazardous life, in various climes, he was always plain and temperate in his eating and drinking; and avoided spiritous liquors, except once when he was a lieutenant in a privateer, which sailed from Barbadoes in Queen Anne's wars on a cruise on the Spanish main, he, with 50 or 60 men made a descent on a village; in pillaging of which most of his men, became intoxicated. The Spaniards took advantage of their situation, and got between them and the sea, and killed every man of his party, except himself & one other, who they made prisoners; from which state he attempted on escape, by cutting out a sloop, but was detected and again put into confinement. He married his first wife in New-York, whose maiden-name was Catherine Cheeseman, by whom he had 8 children, 25 grand children, 23 great grand children, and 3 great great grand children. At the age of 51 he married his second wife, in Philadelphia; her maiden-name was Ann Vanlear, 19 years old when he married her; he had 17 children, 41 grand children, and 15 great grand children. His second wife died in Philadelphia, 14th November, 1788, aged 72 years and a half. He never had a headache; and often said that he thought himself in his prime of life, when he was at the age of 60 years. He was always fond of fishing and fowling; and until his 81st year, he used to carry in his hunting excursions, a heavy English musket. He was ever a quiet, temperate, and hard working man. He can see, hear and walk about, and has a good appetite, with no complaints whatever, except mere weakness of old age. ​ In the early part of his life he was on two scouts against the Indians; he used to tell that in one of those excursions, they went out in the night, how they lifted up their feet high in stepping to prevent a noise amongst the leaves; that they took an Indian woman prisoner, who led them to where the Indians lay; that they fired on and killed the most of the Indians before they could get to their arms, and only a few escaped. That the Indians came in and made a peace, before this scouting party returned. He knew the noted pirate Teach, called Blackbeard; that an act of oblivion had passed, which permitted al, pirates to return to their allegiance; that Blackbeard then came to Barbadoes, where he saw him; this was a short time before that pirate made his last cruize, and was killed in Carolina. His grandfather, by his mother's side, Mr. Arthur Strangeways, died at Boston, sitting in his chair, when at the age of 101 years. His father, Mr. John Hutton, was born at Bournesdures, in Scotland, where, it is said, there are many of the family now living."